Heel pain can have various causes. Symptoms on the underside of the foot and the heel are often referred to as "calcaneal spur", however his is not always correct. 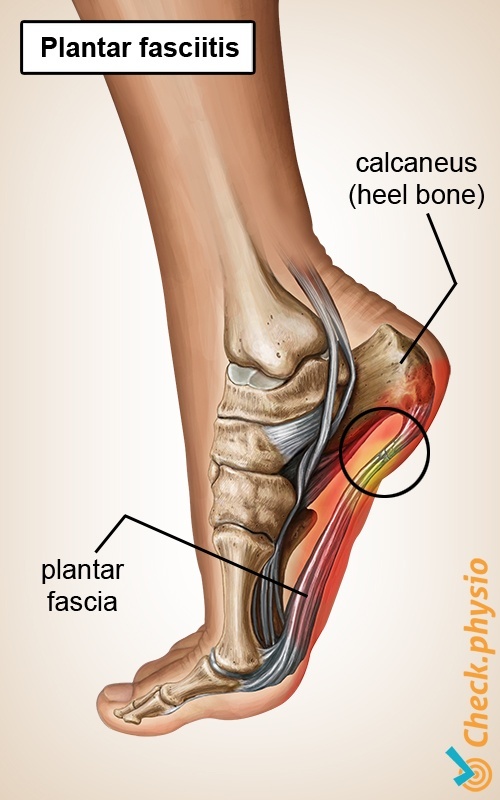 The terms "plantar fasciitis", "plantar fasciosis" and "calcaneal spur" are often used interchangeably. All three can describe heel pain when walking. The various presentations are discussed in this article. A thick, fibrous band of connective tissue, called the "plantar fascia" is located under the sole of the foot. It runs along the bottom of the heel bone (the calcaneus) to the base of the toes. The fascia is particularly strong and supports the entire foot. The fascia is forcefully stretched when walking or standing on the toes. If the fascia becomes inflamed, we refer to this as plantar fasciitis. This is not always the case. "Plantar fasciosis" can also occur. This means that the quality and structure of the fascia deteriorates, making it more vulnerable. Fasciitis and plantar fasciosis can both result in very irritating pain on the underside of the foot whilst walking. Heel spur or calcaneal spur is a thorn-shaped calcification at the site where the fascia attaches to the heel bone. Research has demonstrated that the majority of elderly people have heel spur. However, this does not always result in symptoms. 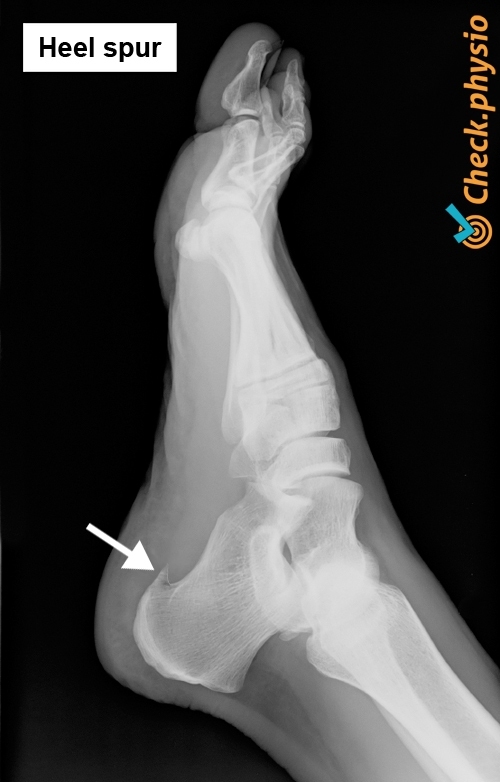 A heel spur probably develops as a result of prolonged compression of a small surface area of the heel bone. It is a gradual process that develops further as we age. The excessive bone formation associated with heel spur can start to irritate the surrounding structures in the immediate vicinity. However, it is thought that in some cases heel spur is actually a functional adaptation by the body to protect the heel bone against overloading. The symptoms usually occur whilst walking or standing for extended periods. People with excess weight are more likely to suffer heel spurs. Pain on the underside of the foot at the site where the plantar fascia attaches to the heel bone. Pressure on the site where the fascia attaches to the heel bone is painful. Pain whilst walking or standing. Start-up pain can occur. In that case, there are more symptoms when the patient has not walked for some time (for example in the morning or after sitting in a chair for an extended period). In some cases the heel fat pad is swollen. Passive fully-extending of the toes can exacerbate the symptoms (stretching of the fascia). Treatment can be a lengthy process. Excessive pressure on the heel bone must be relieved. There are a number of options to achieve this, including weight loss, insoles, less walking/running and not walking on socks or bare feet. In addition, the fascia is also treated, so that the quality and structure improves. This is achieved by means of stretching exercises and (eccentric) strength training. Sometimes it can help to buy proper footwear with a rigid sole. The sole of the shoe does not bend as much whilst walking, so that the toes cannot flex too far upwards. This prevents additional stretching of the fascia.